As is often the case, the United States Mint’s newest product for collectors was its strongest weekly seller. 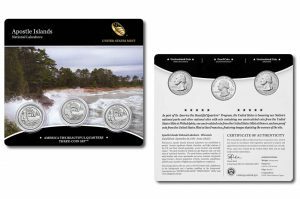 Released last week on Tuesday, April 17, the Apostle Islands Three-Coin Set features an uncirculated quarter from the Philadelphia and Denver Mints and a proof quarter from the San Francisco Mint. The collectible posted six-day sales of 9,855 for a mid-level opening performance compared to other recent issues. 10,086 sets for Shawnee National Forest of Illinois (2016),. The latest sales for these sets are available further below. The U.S. Mint published sales data for 151 numismatic products. Thirty-nine products outperformed their prior weekly gains against 80 previously. Not counting the new Apostle Islands product so as to compare apples-to-apples, 1 product increased by more than 1,000 units compared to 6 previously. In addition, 9 products saw their sales totals reduced against 12 previously. Three products registered larger-than-typical reductions — the 2018 Proof Silver Eagle (-4,084 to 261,624); the 2018 Kennedy Two-Roll Set (-785 to 12,767); and the 2018 Kennedy 200-Coin Bag (-682 to 3,182). Below are tables showing the latest sales for U.S. Mint numismatic products. The sales period covers from April 16 to 22. Products with an asterisk (*) are no longer available or had no reported sales. Never did say why the name *Apolste, unless *i over looked it over the months, so*i checked out why, for myself or anyone who would like to know! Early 1800’s *Jusuits , who were drawing out maps of the area, gave the islands the name, *i guess they had a *habit to name places, with no names yet, *i would think, but you never know, the *Natives, had a name for it first! But they did give names and towns from the *bible, *Bethlaham, PA. all though three words are spelt wrong, well 4 words.